One of our popular member Tutorial Videos shows how, with Google Maps, you can star a place on the map. That star will always show up as long as you are logged in to your Google Account. We use this feature all the time to mark our current RV park – because that is ‘Home’ for a while. 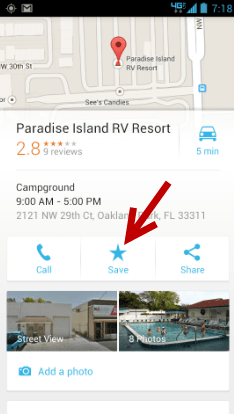 One of my fears in living on the road is that I’ll go to the grocery store and not have a clue how to get “Home!” By saving the place in Google Maps, I can now just open Google Maps on my Android phone, tap the little Star icon that represents our current RV park, and navigate back there! The fear is gone. The same feature is available on the iPhone/iPad version as well as the web-based Google Maps. Google has made many changes to the Google Maps app on Android and iPhone, as well as on the maps.google.com website. Some of them are major – like changing My Maps to use what they call the Google Maps Engine. Some of them are minor, like the procedure for Saving a place to your map. If you’re not at a named place, you need to touch and hold, aka ‘Longpress’ on the little blue dot that represents your location. It is best to be zoomed in really close. You should see a red marker appear, that’s a ‘dropped pin.’ If the pin is located at a recognizable street address, you will see an info sheet similar to the one for a named location. But, if you’re kayaking in the Everglades, there is no address and you can’t save that location with a star. However, you can share the location with an email. So, for example, if you are boondocking in the open desert and you want to send directions for your friends to find you, you can still do it by dropping a pin, then tapping the Share icon and sending an email. If you need the location, send the email to yourself. Why it can send an email with GPS coordinates, but it can’t ‘star’ it – I have no idea. 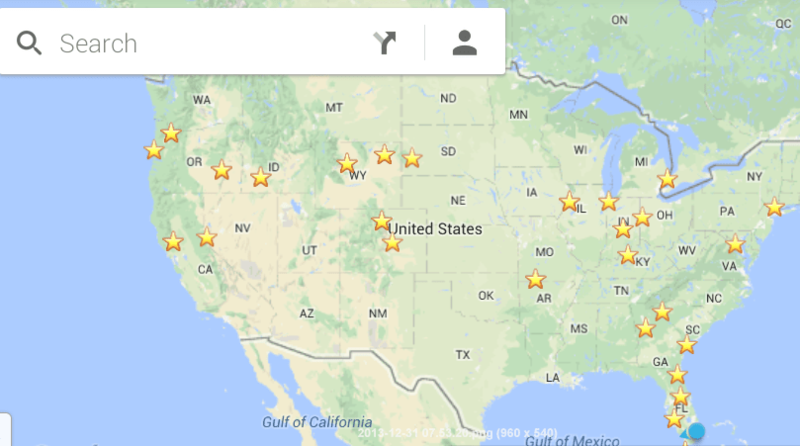 I have starred places all over the country. Whenever I look at Google maps, and I’m logged in to my Google account, I see gold stars – on any mobile device or on the web. This is oh so handy when you’re traveling in an area you’ve been before and want an easy way to find a prior destination. The one improvement I would like to see is the ability to give names to those stars, like “Susan’s driveway” or “John’s RV park”. As it is, when you zoom in on a starred location, you will see the name of place, or the address – but I haven’t figured out a way to edit the name and make it your own. You can create a custom map – then you can name your markers and add pictures and text. That will be a subject for next month’s newsletter. 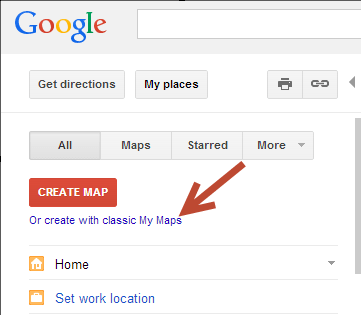 There are member videos on how to make custom maps, but there have been some substantial changes to these procedures using the New Google Maps Engine. 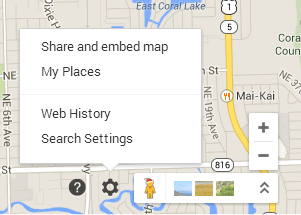 There is a link on the New Google Maps, My Places, to use the Classic Maps. With Custom Maps, you could have a map of just your favorite boondocking locations. This could be private, just for your eyes, or you could share it with your RV club! Watch for the Geeks on Tour Member videos in the coming months. If you need to become a member, you can learn how to join here. Published by MrsGeek, in Blog. Tagged with Dropping Pin with Google Maps, Saving Places with Google Maps.